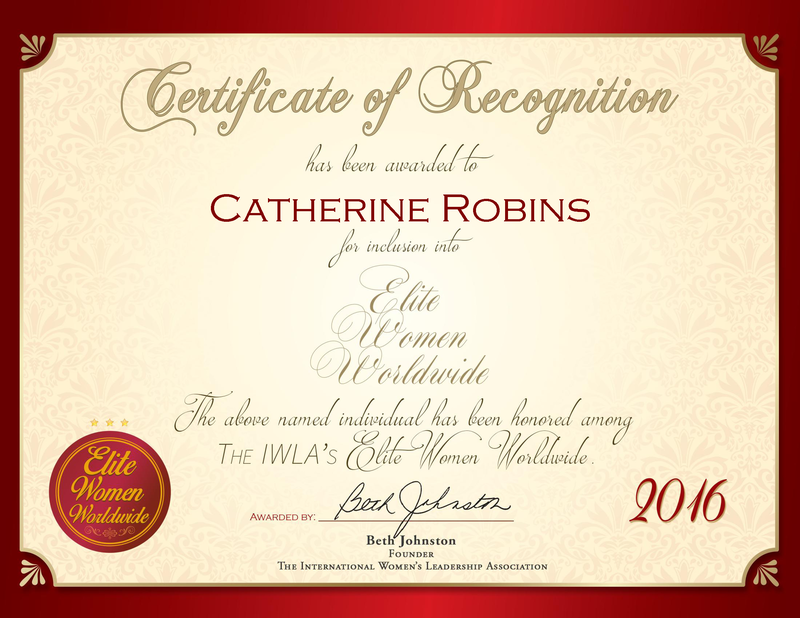 Pflugerville, TX, March 22, 2016, Catherine Robins, Owner of Robins Oil & Gas Research, has been recognized by Elite Women Worldwide, for dedication, achievement and leadership in oil and gas research. For more than 20 years, Catherine Robins has worked as an oil and gas mineral consultant. She has provided her expertise and research findings to government agencies and oil companies. In 2004, Ms. Robins made the decision to open her own firm, and established her main goal of working in conjunction with estate and client professionals who have holdings in minerals. Her business closes the gap in the industry on providing representation to mineral and working interest owners in dealings with oil and gas companies, and taxing authorities. Her responsibilities include negotiating oil, gas and mineral leases, seismic permits, pipeline easements, and ratification of lease and pooling to protect her client’s best interests. In addition, she maximizes royalty interest, and lease terms, conditions and bonuses. To enforce the Natural Resource Code she monitors the acreage for development and wells on properties across the United States. Ms. Robins attended Oklahoma City University and stays connected to her industry as a member of America’s Association of Petroleum Landmen (AAPL), and the National Association of Division Order Analysts (NADOA). In 2009, she instructed a class in the steps required to properly transfer ownership of mineral interests and how to avoid future title curative actions for the Houston chapter of the NADOA analysts. She provides her knowledge with mapping and research to the Texas Railroad Commission. Prior to opening and operating her firm, she has worked for oil and gas companies as a revenue and division order analyst and as a joint venture auditor. As a joint venture auditor, she offered accountability and reconciled production volumes being paid to royalty and working interest owners. In addition to being recognized by the International Women’s Leadership Association, she has been featured in Top Female Executives, Professionals and Entrepreneurs.